The British weather is notoriously unreliable. Any given bank holiday and you can almost guarantee it will pour with rain, while it can be frustrating to see the sun shining outside while you’re huddled ill under a duvet, or trapped in a seemingly-endless board meeting. That’s why the great British tradition of everyone making a mad rush for the beach as soon as there’s a hint of a sunny weekend remains so strong. If you’re planning to hit the beach in Brighton, Bournemouth, Skegness or Cornwall this weekend, remember to include one or two cotton bags in your packing – they can come in handy in a variety of ways! Another fantastic tradition we have in this country is the picnic, where we fend off seagulls and wasps while trying to find the mustard. A wicker picnic basket is a thing of beauty, but expensive, while a cooler is useful, but bulky. If you’re just nipping out for an impromptu couple of sandwiches on the beach then, a cotton bag is ideal for keeping your hands free and carrying your picnic around comfortably. 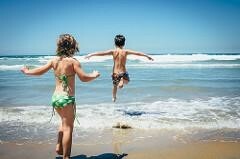 All kids love a day at the seaside – for many of us long days spent building sandcastles or collecting seashells are some of our most cherished childhood memories. But the beach is also messy, and you can guarantee the kids will be coming home covered in sand. Pack a spare set of clothes in your cotton bag, then after they’ve got changed, chuck the sandy ones into the bag, then you can put the whole lot, bag as well, into the washing-machine. A versatile cotton bag is the perfect way to bring home your kids’ collection of beach toys, shells, driftwood, colourful stones or any other weird and wonderful things they’ve found – solitary crab’s leg anyone? An easy way to rinse the sand off them is just to pop them all in the bag, then dip that into the sea. Not every British beach is sandy – many, such as popular Brighton & Hove, are covered in stones, which can be uncomfortable. An empty cotton bag can make sitting-down a little more comfortable, or fill it up with clothes and hey-presto! A makeshift pillow. If you’re only driving a short distance home, then a cotton tote bag can be useful to protect your car seats from the smelly peril of damp children and damp dogs.